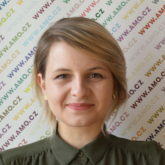 Alžběta Bajerová is a Project Assistant at AMO where she works on the ChinfluenCE international research project. She graduated from Master’s program Security and Strategic Studies at Faculty of Social Studies of Masaryk University, Brno, where she also received her BA from International Relations. She completed a study exchange programme at National Taiwan University and gained work experience through internships at the Embassy of the Czech Republic in China, NATO CCD Centre of Excellence, or National Cyber and Information Security Agency (NCISA). She is also a co-founder of Zvol Si Info, an initiative that fights propaganda through education. Alžběta focuses on China’s foreign policy, Sino-Russian relations, influence operations, as well as cyber and information security.